When I was pregnant with you, you hurt the inside of my ribs. Like you installed a punching bag just under my ribcage and just went at it while I was on the couch. You moved so much more than your brother, I knew we were in for it. You never stopped. Always on the move. Ready for anything. We thought you’d never come out of me, you were so huge. We didn’t know it was 10 lbs 11 ounces huge, but they still were able to get you out. You came along. Our world changed forever. I couldn’t put you on solid foods. It was a mental block that once I put you on solids, the whole baby thing would fly by and all of a sudden you’d be in Kindergarten. Well, let’s just say I was 100% correct on this one. We started solids around 8 months. You liked them. You came along. I sold your crib on Craigslist before I thought about how you would sleep without it. We got a toddler bed and set it all up that night. It was then that we realized how funny your sleep positioning was going to get without walls. I still find you in all different places in your room at night when I go in to check on you. on the floor, half off the bed, next to a row of dolls next to your dollhouse. You were all set with the non-crib sleeping before I was okay with it. I came along. When you were 18 months old, you didn’t talk a lot. We were worried because your brother was such a talker. But, the pediatrician said your words would come. You said, “Hi Baby” on repeat so much that we worried that’s all you would ever say. But you didn’t. You came along. When you were three, you became a night owl. We could hear you singing often until 9:30 pm. Your room would look like preschool-meets-frat party. You would often fall asleep on your floor in costume. One time you had socks on your hands and fell asleep like that. In the summer. In a room without air conditioning. We thought you’d never have a normal bedtime again. But you did, eventually in preschool. You came along. Your laugh. If I could bottle it up, I would. And I would keep it all for me when I get old and want to hear it again. Your laugh is the epicenter of family dinner and backseat conversations. We all light up when we hear you laugh. Your preschool report card even remarked on your laugh. It’s that electric. But Kindergarten? Why Kindergarten? Why are you going to take away all these beautiful memories from me by growing up and becoming a big kid? Why do I have to watch you walk away with a backpack of confidence that I am real freaking sure I never had as a child? Why can’t you be a not-talking-enough-up-all-night-dancing-singing talisman I hold with me all day long? Why and when did you become a person instead of my baby? Why did you learn so much and absorb so much and take so much out of us as you grew? Because, just as with all things, when you were ready, you came along. I do proclaim here and now that there was never a girl I know more ready for the leap to kindergarten. Whether it’s been watching your brother, just 21 months older than you walk the paces or just because that little soul inside of you is meant to keep-up-whether-you-are-old-enough-or-not. You are ready. Like really ready. Like backpacked already packed with supplies ready. So where does that leave us? We just grow you up and then release you because that’s just what happens when kids turn five? 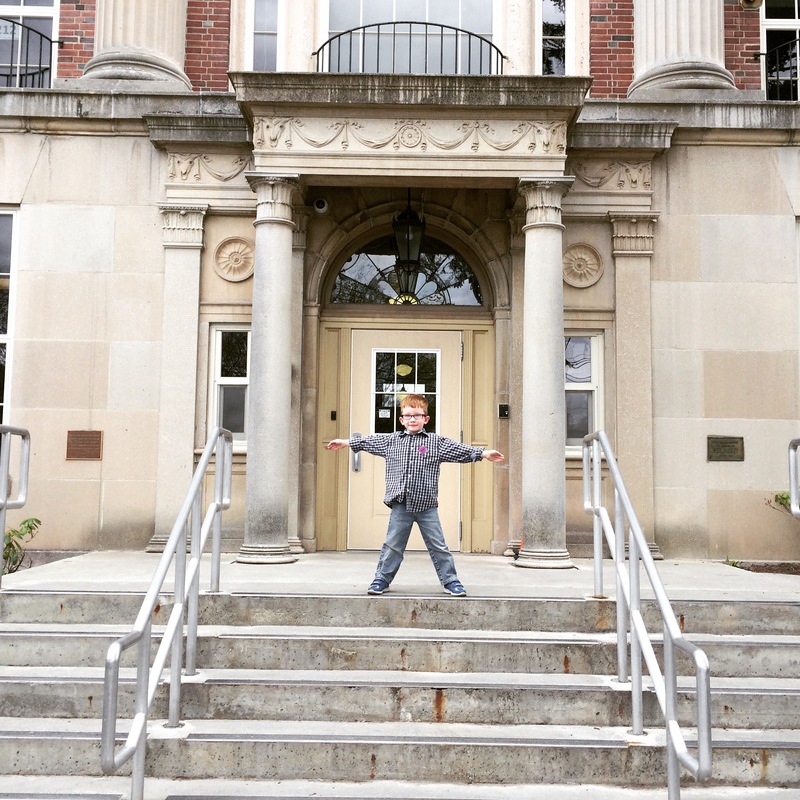 What’s next– First grade? Second? THIRD? A wise mother once said to me, “they do not belong to us, they belong to the world” when she saw her fifth (!) child off to kindergarten. And indeed you never have belonged to me. You were always more wild and free and boisterous and precocious than I thought I could ever be lucky enough to parent. You were sometimes more of a challenge and mystery than I thought that I could handle. But you were always a sparkly, shiny, you. Today, I brushed your hair (you were screaming but still, bear with me) and I told you that sometimes God puts sparkle into girls’ eyes to help them light up the world. I made it up in the most wise Mommy-folklore moments but when it comes to you, I think it’s true. Your eyes, your laugh, your little Brooklyn accent have brought more to me as a person than I ever thought I deserved. You are as beautiful as the words you use, the hands you work with and the relationships you build. Have confidence in those things and this milestone (like all the ones before them), will come along just perfectly. Being the baby of the family, I find it second nature to roll my eyes at someone recounting a memory or formulating advice or telling me what to do. Because my mother can tell you, no one really can tell me what to do. Even at a young age, I decided that. I chose a career in teaching where essentially, I tell teenagers what to do all day long. I bristle when my husband tells me what to do and am quick to fire back when my kids make a bossy remark or an impolite request. I’m often the friend who gets everyone together or suggests an outing. Essentially, I’m in charge. I call the shots. We do what I say we do (or so I think). Well, guess what? To this morsel of advice bestowed upon me by many-a-Mama, I listened. I appreciated, I journaled, I slowed it down and ate up. Every. Last. Minute. And it still flew by. It still got out of my grasp. It still snuck up on me. Like housework and laundry and dust bunnies. It happened. So fast. And I still feel like I missed it. Because the day to day and the month to month and the season to season and the holiday to holiday become a part of the fiber of your life. The moments are but pixels on those fibers that connect from event to event to event to year to year to year. And pretty soon, you’re six and a half years into parenting and you feel like you know nothing. Babies are something you used to get, toddlers are something you understand like a class you took last semester. Sleepless nights are like a wild frat party you once went to but can’t believe you survived. Making baby food is like signing up for a class at 8 am. Oh you were so young and naive. But the now and the who and the what of today are what dominate your parenting. There’s not a lot of time to look back. Except when you look and there are little people, real PEOPLE in your rearview mirror. Real people with ideas and thoughts and opinions and preferences and little moral compasses. Real people with political leanings and informed decisions. Real people with worlds of their own. Worlds you are welcome into but sometimes only in an ancillary way. On special person’s day or when they have a sliver or they need help with a science project. You are not the nap-snuggler or the milk-maker anymore. Just the Lunch Packer, the Bedtime Enforcer and the Writer of Notes. Driver of the Station Wagon. Facilitator of the Netflix. Today, I was the Mom of a kindergartener and first grader. Today, I was an adult with paperwork and medical forms and test results and words of encouragement for my little girl. Today I was a different kind of grown up. Like Toto, we aren’t in Kansas anymore. It seems like parenthood is this secret room. The room behind the bookcase, the secret passageway of life. There’s so many wonderful books to sift through that sometimes you get lost in your own wonder. You get lost and forget how long you’ve been in there. You get fooled by the broken clock just inside the passageway. You return from the passageway older, more serious, softer. In looking at the little spirit we raised today going through the paces of kindergarten screening, I felt like an imposter. Both feet fully planted into “School-Aged Mom and Dad” life, we schmoozed, we chatted with the teachers, we smiled proudly. I gulped back Mama tears. The tears that mean nostalgia, sadness, loss. And, together, we readied ourselves for another beginning, another ending—another passageway to open. So, listen when people tell you it goes fast. Obey their advice. Do your damnedest to freeze it. But know, that still, you will be sitting stunned at a kindergarten screening someday— wondering where the time went. And stay in the secret passage, relish in it in all of its cacophony and chaos. And at night, sneak into their rooms, smell their heads and lay next to them. Because, hey, even if they squirm and grimace when you kiss them in public, there’s a special secret passageway for parents into their bedrooms at night. No joke. The quote above was on a wooden plaque at the refreshment table at kindergarten orientation this week. As I filled my coffee, tears streamed down my face. Nothing summarized my feeling that day better. Depending on how many children you are blessed with, you are only given so many special days. Milestones like birthdays, graduations, awards, performances and athletics of all seasons come close together and often at first but soon space out a little more. Some changes are easy and almost un-ceremonial— the movement from crib to bed— the movement from formula to milk. And before you know it, they are eating off of real plates with real silverware and wiped their face with a napkin all on their own. I’ve had a lump in my throat developing since I signed Parker up for Kindergarten. It was such a startling watershed for me- being thrust into the school age years. I felt sad that the little red headed baby boy I used to nuzzle was now a little man. The little face I wiped yogurt and peas and applesauce and boogers off of was now the face of a kindergartener, a boy who can write his name and count to 20 and make friends all on his own. If my next couple months could have a hashtag, it would be #imnotreadyforthis. This feels big. The departure from the preschool years is a sad goodbye for me. There was such sweetness and purity to seeing your child make their way through preschool. I saw him sing at his Christmas pageant, host his grandparents at the grandparent luncheon and march with his classmates in a Halloween parade. I sat in a row of chairs with paperwork to keep me occupied and watched as family after family were guided around with their little person. I thought how in a year, I would be in the same set of chairs doing it all over again for Celia. Life just continues on like that, I guess. Little people grow up and go to school. The circle of life. But somehow, in that gym as I sipped my coffee and gulped back tears, I knew this: something is over. And I have to accept it. And mourn it. And embrace it. 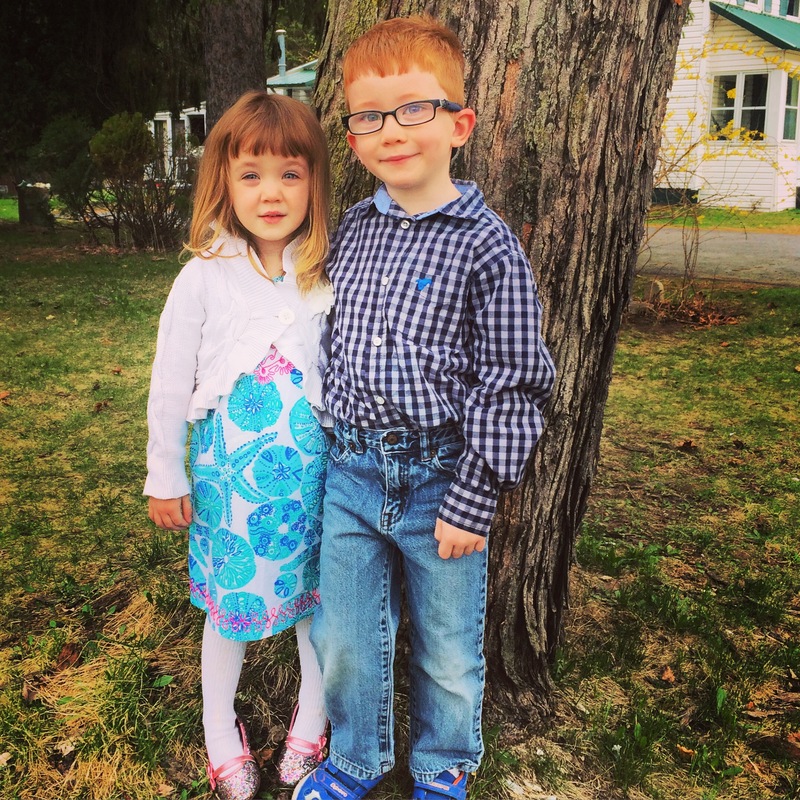 What’s over is this: my time as a Mom of “small” kids. Small kids usually fit into the category of infant, toddler or preschooler. Only for one more year will that be true. It’s officially and startingly the end of an era. I feel a desperation I thought only came with graduation day or dropping your child off at college. It’s fair to say I’m hyper-emotive in times like these. I was awarded my sorority’s “Sap Dog” award for my quick tears and sentimentality. I like writing long, important verses to friends in birthday cards. I like to feel things through tears. I don’t enjoy being sad, but I do think the catharsis that comes with feeling something is a good feeling. As Jimmy Valzano said in his ESPY speech before his death, “If you laugh, you think and you cry, that’s a full day. That’s a heck of a day. You do that seven days a week, you’re going to have something special.” That’s what I believe about my sappy tendency. It helps me connect with these moments in my life to the fullest. As “sad” as the day was, this was the way the rest of it went. 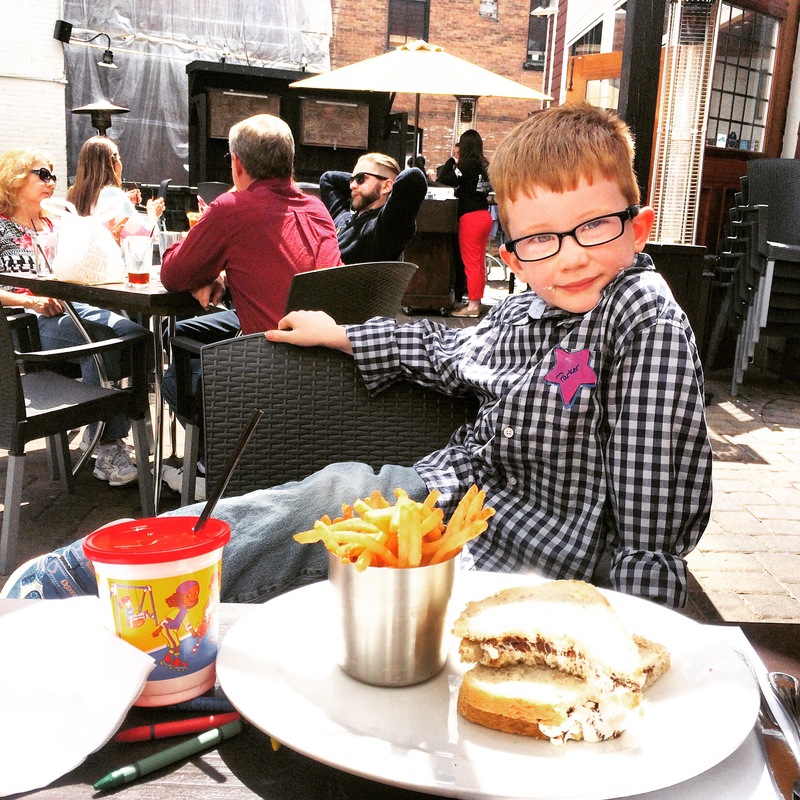 My son saw three friends he knew in the school on our way out, he and I went out to a lunch by ourselves and had lovely conversation. 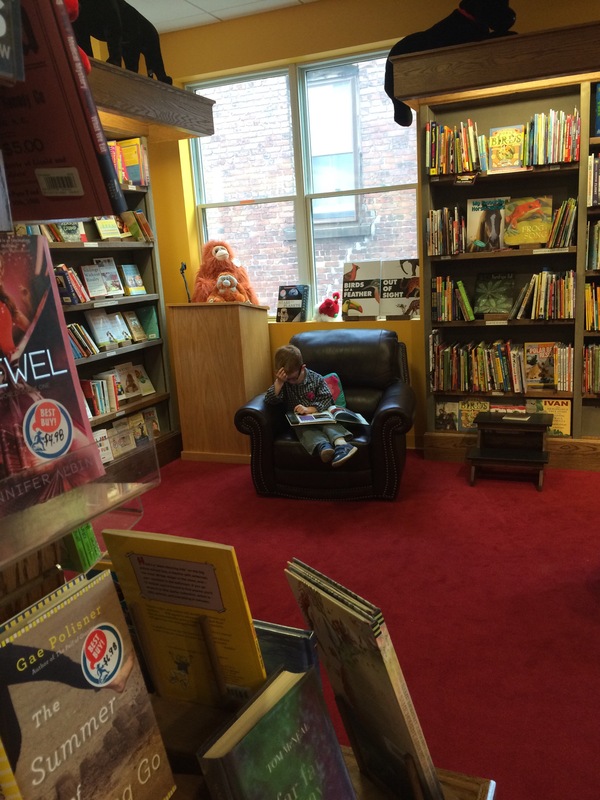 Then, we got lost in a bookstore together– one of my personal favorite things to do. It ended with a walk by a boutique where we both noticed a locket. “You should get this Mommy, I like it.” It has a spot inside for both of their little faces. It was not a tough sell. I told him I would get it so I could remember this day forever. The little things in life ARE the big things. Fleeting, slippery little things. Sometimes we have to look up from laundry and dishes and grocery shopping for a minute to catch these pieces of life. For its these pieces that will make a real live “big” person one day. So, the clock’s ticking. Four more months before little Parker takes on his own big little part of life. Okay, I’ll admit it. I fell off the blogging earth for a little too long this time. I can blame it on being “busy” and having “so much going on.” But, judging by the amount of Netflix and Amazon Prime shows I’ve binged on this winter, I’m not going to try to kid you with that hooey. I could blame it on the whole “we have a new house and the renovations have been intense.” But those have kind of taken a hiatus for the colder months as well. I could blame it on poor Chewy Gallagher, our new little puppy— but is that really fair? She doesn’t even know I have a blog. How would she know that the time spent picking up her chewed paper towels is really messing with my creativity? I could blame it on Celia, who really demands to be seen and heard every second with her variety of performance techniques. I think it may be more because of the fact that my person exerts so many words a day that I can’t possibly afford to put together the well crafted paragraphs and elegantly worded witticisms that I once was able to. I couldn’t get it together for Thanksgiving, Christmas or even in spirit of the New Year. I started to think that maybe my blogging life was a little bit over— like I had a nice run, but, it’s time to move on. Then I typed www.shortcutgirl.com into the web browser box. And read a few pieces. And missed it. All of the things that I have been blogging about the past couple years read like a diary. A confession of the hard won victories of parenthood (and life) and the mini victories– the moments when you Just. Nail. It. This blog is not just a girl who likes to take shortcuts (oh yes, believe me it IS that) but this blog is the evolution of a parent of babies to a parent of toddlers, to a parent of an almost-kindergartener (I know, I can’t even…). It’s been a safe haven for me to make sense of the unsettling nature of your first parenting experiences as well as a place for me to express my own A-ha! moments when it comes to my friendships, my body, my husband and the most important relationship you have sometimes—the relationship you have with yourself. Just like when you read your diary from childhood, I look back on some of these posts and see things I don’t remember. Behaviors my children had, phases I had trouble getting through and most of all very vivid and descriptive memories of my children in what seems like just a blink of time. Memories with your children are different. Each thing you do with them and for them becomes a memory that they will relay to you at a later date. That looooonng car ride on vacation or that day when the puppy tore up the couch cushions (didn’t happen and WON’T happen, got it?) are all a part of who they are. Everything from your dinner conversation to the way you say good night to them is a big, fat, deposit in their memory bank. A slice of family-life-as-a-kid for them to feast on for years to come. A reflection of you as a parent. What’s really gotten to me lately is the idea that in a few short years, my kids won’t be at my ankles in the kitchen while I cook. They won’t be homework free playing in their pajamas downstairs at 6 pm. They won’t be begging to play with the dog rather than sit at the table and eat dinner. These deposits, the ones of the pre-K, not yet school aged years are limited. In the next two years, I will send both kids off to school and (gulp) be wrangling homework and backpacks and parent-teacher conferences. Pretty soon the noisy after school banter of brother and sister will be traded for the hum of ear buds and music played behind closed doors. My memory bank already feels like it is bursting at the seams, no room for more deposits of funny stories or toddler talk or silly malapropisms. Even so, I will keep up my own deposits. Taking little mind snapshots and short videos in order to preserve, to hold tight and really feel the payoff of each memory. The idea that with these people you created and are somehow expected to guide through life, you have a wealth of history to withdrawal from any time you wish. 1. That the mere suggestion of a birthday party, lunch or social event during nap time could make me instantly start sweating. 2. That I would feel perfectly justified in bringing an IPad to a restaurant. 3. That a shower in a locked bathroom would feel like a full spa day at the right moment. 4. That I would get irrationally angry at waitresses who mentioned “dessert” to clearly behaving children. 5. That I would get irrationally angry at waitresses who did not mention “dessert” to clearly misbehaving children. 7. That I would get my kids to smile for Christmas card photos by bribing them with Swedish Fish. 9. That I would be the type of Mom who yelled. 10. That I would be the type of Mom who yelled at Wal-Mart. 11. That I would be the type of Mom who only had to stop for gogurt and goldfish but suddenly felt like I was on the Reality Show “This is Your Toddler” where your child suddenly turns into a savage beast and the entire community watches via security cameras. 12. That I would sometimes cry wondrous tears of joy when someone offered to babysit for free, for pay or (the rarity) –overnight! 13. That my heart would actually feel like it could burst out of my chest with pride. 14. That I would love my husband more as a father than I did as a man. 15. That I would sometimes use the “stinky feet test” for deciding on whether it was a bath night or not. 16. That I would prefer buying cute clothes for my kids than for myself. 17. That they, even at ages 3 and 4, could be my best friends. 18. That Saturday morning soccer in my thirties would feel like penance for all the Friday afternoon Happy Hours of my twenties.